Sorry for disappearing. Life keeps me busy and away from my computer so I can´t find the time to blog as much as I wish but I have a million things I want to write about. They will get here sooner or later. Please be patient! The death of Michael Jackson propelled me to Harlem, to cover the tributes that happened there. I'm sure everybody is already sick of reading about it. It's been a ten days overdose and I won´t fuel it. I just wanted to share the best thing I found in Harlem this week. It has nothing to do with the king of pop but with a sweet human being still alive who was looking for some attention. He also knew how to sing, but he couldn't care less about MJ. He shared some Nat King Cole's love with me and some friends. 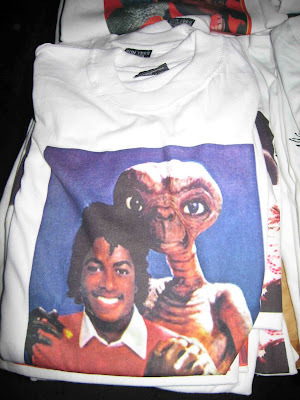 He and this t-shirt that I regret I didn't buy are my memories on the MJ post-mortem week.